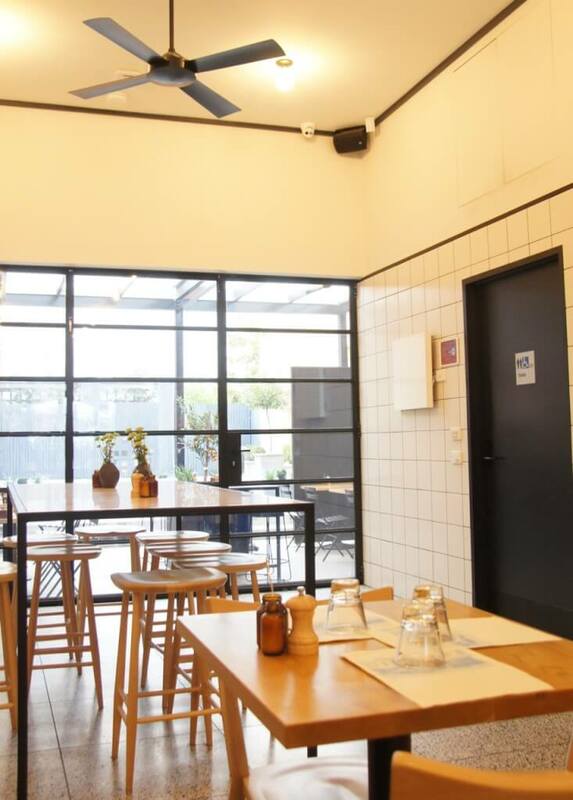 Square and Compass in East Melbourne was recently crowned as one of Melbourne’s best new cafes and it’s the combined work of owners with links to Pillar of Salt, Touchwood and Barry. Square and Compass stands alone on Clarendon Street inside a red brick terrace house, surrounded by residences, offices, health services and hospital blocks. Since its opening it’s been a drawcard for East Melbourne locals and workers bereft of good eateries at the northern end of Fitzroy Gardens. The cafe is bright and welcoming and at 8am on a Sunday it’s already filling up. It’s too cold to hang out at the chic courtyard at the back but come summer I’m sure it’ll be popular. 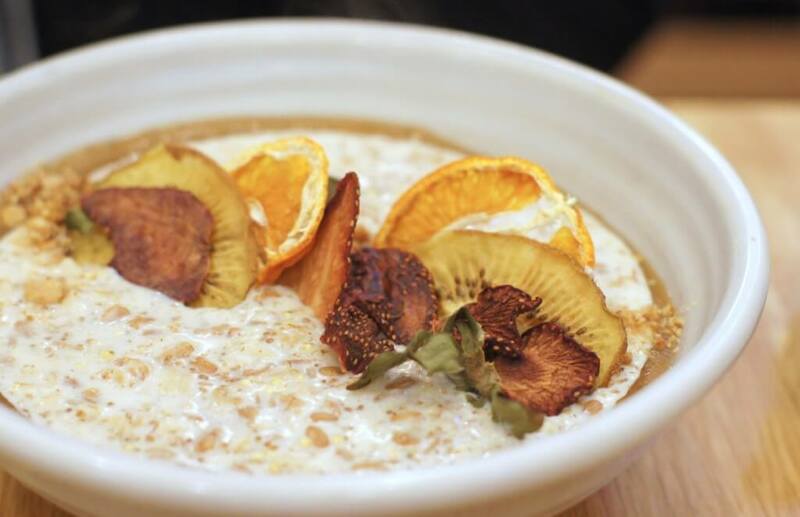 … the five grain porridge, with a ribbon of sweet apple puree creaminess punctuated by a crunchy crumble. It’s sort of like mixing an apple pie into your oats! However, I’d prefer fresh fruit to dehydrated fruit – stretchy, leathery dried fruit has never been my thing. ($13.50). 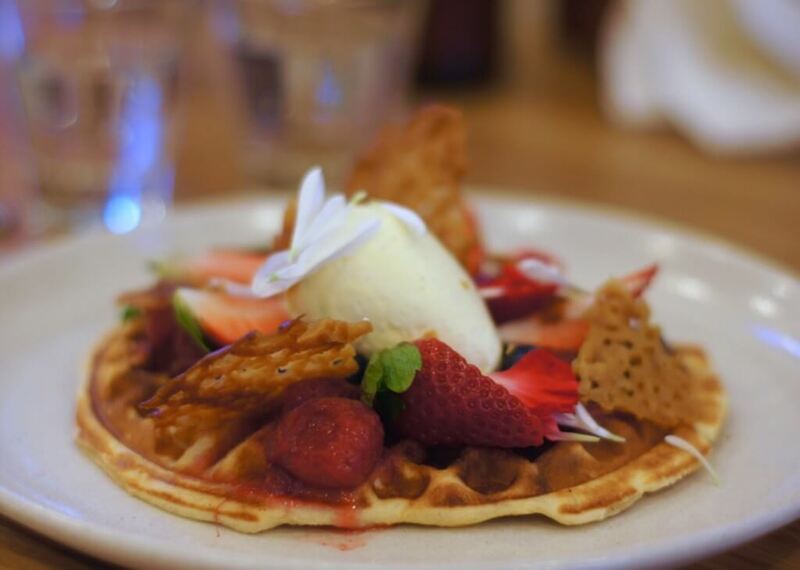 …the waffles, a gorgeous berry and flower-strewn palette atop some fluffy waffles. I like the addition of brandy snaps jutting out of the vanilla-flecked cream ($16.50). 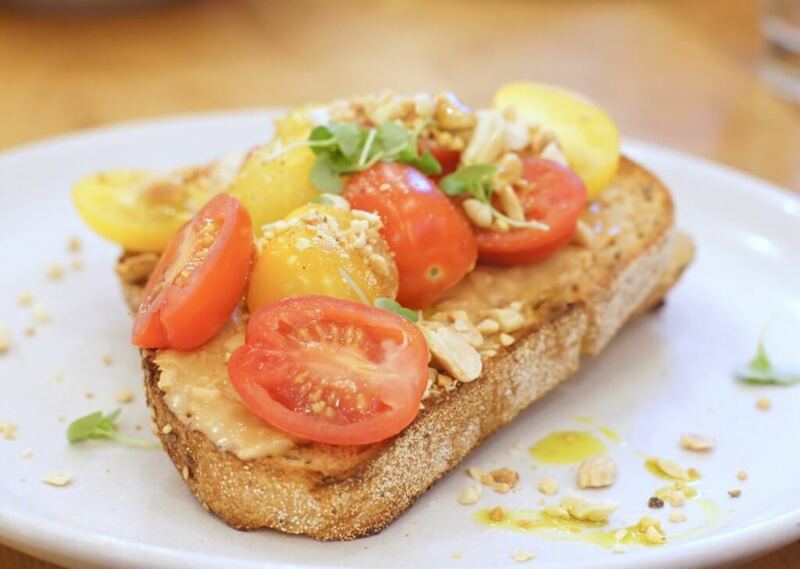 …peanut butter, heirloom tomatoes and toasted peanuts on toast ($13). The combination sounds weird but the menu says ‘trust us’ – so I do. It does work surprisingly well. The peanut butter is not particularly sweet and the savoury nuttiness balances out the tangy juicy tomatoes. I’m surprised it’s not on more cafe menus because now I’ve tried it once it seems like an entirely appropriate sandwich combination. 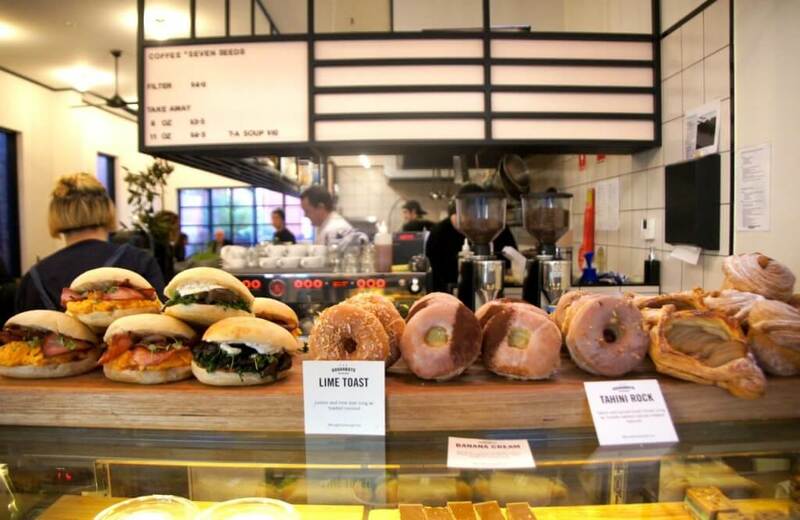 They serve coffee by Seven Seeds and Promised Land, Chai Boy chai and Mork hot chocolate. 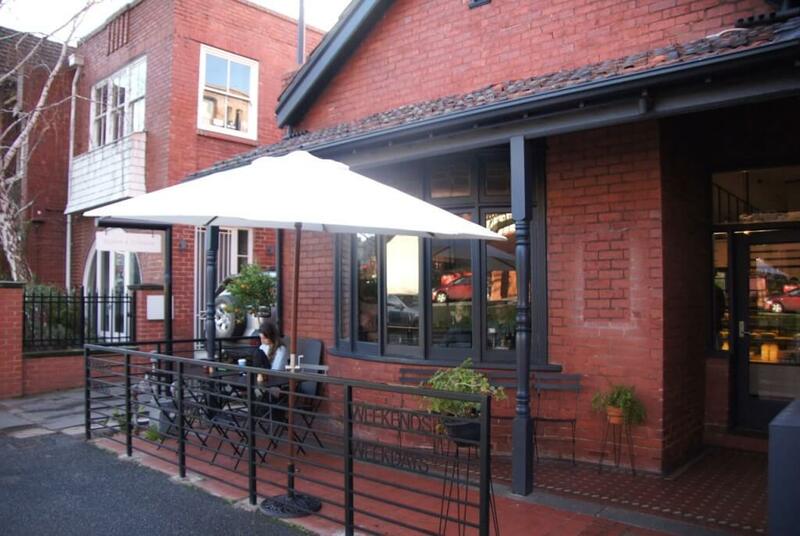 The service is friendly at Square and Compass and it makes a great pit stop if you’re heading to Fitzroy Garden. If you want to take away a picnic I highly recommend their gourmet rolls, particularly the pork belly with crackling (all $10), and maybe grab a decadent Doughboys Doughnuts as well. 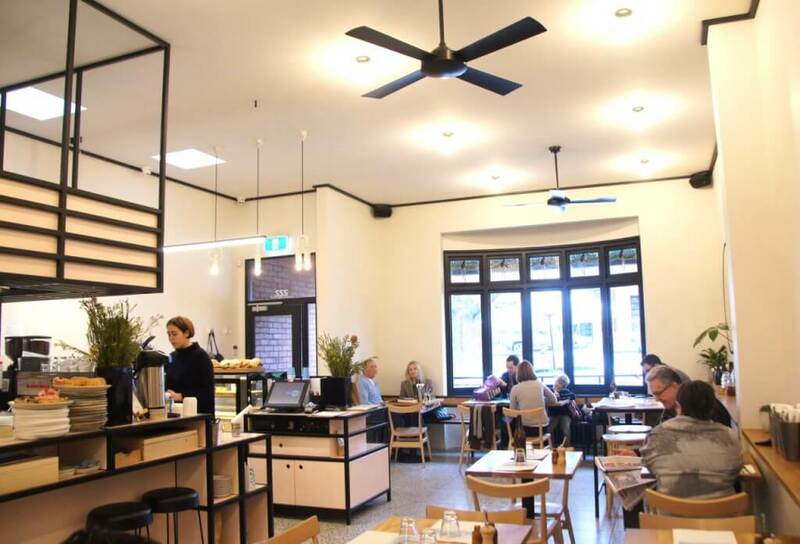 Our absolute favorite local cafe having been ‘followers’ of the Sahely Family for some years with Square & Compass a winner with Matt & Kael and the team serving the very best including our favorite Chilli Scrambled Eggs and the ever changing omelette!